The front drive shaft on a sliding bow tarp system usually needs to be spaced forward of the body to accommodate the vee belt pulley or a motor. 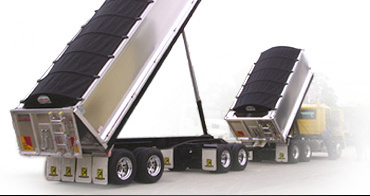 Tipper Tarps "front shaft mounting kits" are the only such system available that not only spaces the front shaft out, it also provides a mounting point for the front bow and allows quick and easy height adjustment of the front bearings. They come in two profiles and are a must for any sliding bow tarp fit up.